In the last article of the year, we start with some key figures from the oil and gas industry. The oil and gas industry, along with its investors, are no doubt happy to close the books on 2015, one of the worst years in recent memory. But it is unclear if 2016 will prove to be a better one for the industry. U.S. crude inventories dropped by 6 million barrels for the week ending on December 18, the largest drawdown in weeks. But that was followed up by a solid gain of nearly 3 million barrels the next week, so it is too early to say whether or not we are at another inflection point. Winter heating demands could provide an extra source of demand moving forward. For now, the oil markets are floundering around without direction. In fact, a new report from Scotiabank Economics finds that oil prices could remain below $50 per barrel for another two years. Scotiabank projects oil prices to average “no more than US$40-45 per barrel for 2016 and US$45-50 per barrel in 2017.” While price estimates like this should always be viewed with some skepticism, if Scotiabank is correct, it would be a dire result and would likely mean that many drillers won’t be around in 2017. In the U.S., the bankruptcy rate should pick up as we head into the New Year. U.S. banks exposed to bad energy loans are also starting to come under increased scrutiny. The U.S. Federal Reserve conducts stress tests on banks that have over $50 billion in assets, and the upcoming reviews will be closely watched to see if bad debt starts to hurt bank balance sheets. For big banks, energy debt is not a major concern. But Wells Fargo recently raised concerns about the banking industry being exposed. Federal banking regulators said in November that the number of loans in danger of default is five times higher than a year ago. Related: OPEC Expects U.S. Oil Production To Rise In 2016… Really? We close out the year with a bout of extreme weather in several places around the world. In the North Sea near Norway, severe storms force oil companies to evacuate some drilling platforms and shut in production. BP (NYSE: BP) and ConocoPhillips (NYSE: COP) had temporarily idled production at some locations. But the worst disaster took place at a rig owned by China Oilfield Services Ltd and operated by Statoil (NYSE: STO), a rig that had been drilling the Troll field in the North Sea. A large wave hit the rig, killing one person and injuring two more. The giant gas field did not see production affected, however. Thus far, it is unclear how extensive the disruption in supply from other fields really is, or how that might affect benchmark prices in the North Sea. The outlook for oil markets in 2016 is just as murky as most of 2015 has been. WTI and Brent close out the year at relative parity in the mid-$30s per barrel. 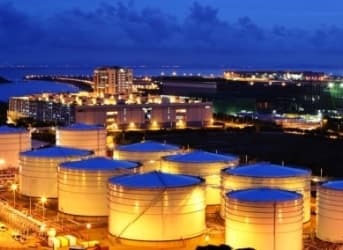 Oil storage levels are high both in the U.S. and around the world. Production is not declining from OPEC, and in the U.S., output is only slightly down at this point. Demand was high in 2015, but will drop off in 2016. The early signs of softening demand growth are already coming into view. Iran is expected to bring oil production back to the market, which could offset expected declines in the U.S. Goldman Sachs says oil may have to drop into the $20s in order for the necessary contraction to take place. On the other hand, the state of oil is not all negative. The optimistic view is that oil companies continue to find ways to reduce costs, even if further efficiency gains are becoming harder to achieve. But, taking a multi-year view on oil, it is important to remember that prices are unsustainably low. Output is going to need to be shut in, and prices will rebound. Depletion will overwhelm new sources of supply. Stronger companies could emerge better off on the rebound as the industry consolidates to a more sustainable size. Moreover, it is possible that the drastic cutbacks in investment today will only lead to a much larger price spike two or three years down the road. That presents opportunities for investors.